As I pack up our bags to go on a plane trip, I always have a few treats to enjoy along the way. Besides the crackers, salami, grapes and snack bars, I grab a surprise or two. Today I found some that my kids are already dying to tear open and indulge! They state on their packaging that they are NUT-FREE and GLUTEN-FREE. According to their ingredient list, they also appear to be milk-free and egg-free! Quadruple SCORE!! 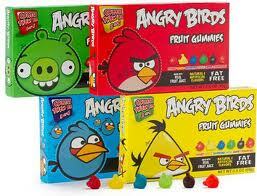 ANGRY BIRDS Fruit Gummies, distributed by Healthy Food Brands, Commack, NY 11725. Ingredients include: SUGAR, CORN SYRUP, WHITE GRAPE JUICE CONCENTRATE, GELATIN, CITRIC ACID, NATURAL AND ARTIFICIAL FLAVOR, FD&C RED 40, YELLOW 5, YELLOW 6, BLUE 1, RED 3, CARNAUBA WAX. I realize that the 'artificial' and 'natural' flavorings may be a worry to some, so only you can decide whether this product is a good choice for your home. So, maybe they aren't the healthiest snack out there! But sometimes it's a great deal of fun to surprise our kids who can't enjoy so many other treats. Please feel free to visit my blog. I have many more resources out there.